Published: Dec. 31, 2012 at 10:42 a.m. Updated: Dec. 31, 2012 at 07:09 p.m.
We have our first surprising firing on Black Monday. Chicago Bears coach Lovie Smith was fired Monday, according to NFL.com's Ian Rapoport, citing a source who has been informed of the situation. The Bears later confirmed the move on Twitter. Smith met with upper management in the morning, and Bears assistants were very nervous, according to Rapoport. News of Smith's firings broke shortly thereafter. As for Smith's assistant coaches, Rapoport reported they'll have to stay with the Bears at least until a new coach is hired, according to a source informed of the process. Smith had a few things working against him, starting with the reality that he hasn't made the playoffs for five of the last six years. An even bigger factor: Bears general manager Phil Emery was just hired before the season. 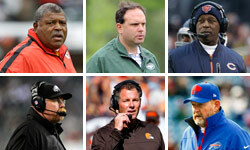 New decision-makers usually want to bring in their own head coaches. NFL.com's Albert Breer reported last week that Emery and other GM candidates were told a year ago that they had to keep Smith for 2012, but after that, the coach's future would be up to them. Emery exercised that right. The Bears failed to make the playoffs after a 7-1 start. While Smith's defense still is dangerous, he consistently has been unable to improve the offense through his staff hires. Smith coached the Bears for nine seasons, making the playoffs three times, including one Super Bowl appearance. The defense always was good, but this was a team that more often hung around the middle of the NFL. With Smith out, quarterback Jay Cutler likely will have to start over with another offensive coordinator.A defense full of players fit to Smith's scheme might not fit well anymore. This was a sensible time to make a change, but the Bears might have to take a step back in 2013 before taking a step forward. UPDATE: Fox Sports insider and NFL Network contributor Jay Glazer notes the Bears already have asked for permission to interview Denver Broncos offensive coordinator Mike McCoy. According to NFL.com's Albert Breer, McCoy is also talking to the Arizona Cardinals about Ken Whisenhunt's old job.